Three years ago the then managing director of Hugo Boss Australia photographed a strange-looking plant and pondered how he might be able to retrieve information on any object once it was captured. The moment made such an impression on Eric Fink that he quit the high-end fashion label and started work on Snaploader, a mobile app that combines leading-edge technologies to deliver on demand information by simply taking a photograph using the app. Described as ‘Shazam for property’, Fink has targeted Snaploader at the five trillion dollar Real Estate industry in Australia. “It’s replacing QR codes. This way you just snap any picture of the property or the property itself and it brings back all the information instantly” Mr Fink said. Fink then developed a next generation floor plan allowing a viewer to easily see inside the property and understand the layout. A Snaploader 3D floor plan offers a fully interactive visual representation of the property that can be included in property listings online or viewed through the app. Statistics show the 3D floor plans are getting more than 100 views each a week in online listings from the major portals. These impressive coloured 3D floor plans can include textures, furnishings and a site plan enabling the viewer to zoom in, rotate and fly thru a dollhouse view of the property. It’s a ‘wow’ marketing piece that captures a buyers’ attention and will get them spending more time looking and interacting with the floor plan. As a buyers tool a good floor plan doesn’t lie. It is based on physical facts, not on an agents’ or owners’ sales pitch or a photographers’ talent at making a normal room look like the lounge room of a mansion. A 3D floor plan can bring an unseen property to life and help reveal what professional photographs often cannot. This is particularly relevant today for an overseas buyer or to help plan a busy schedule to see open for inspections on a weekend. WHAT MORE DOES A 3D FLOOR PLAN OFFER? Don’t assume you are crazy for not understanding a 2D floor plan drawing. If you recently started looking for your next home, more than likely you will need to interpret and understand a floor plan drawing. While for many design professionals it is second nature, for the rest of us the symbols and nomenclature can be difficult to understand. Why alienate prospective buyers with a difficult to read marketing piece? 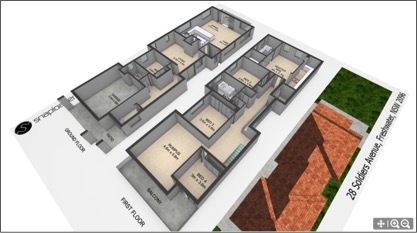 A 3D floor plan is far more visual than a 2D floor plan and is therefore much easier to understand and learn. The virtual model removes architectural symbols for walls, windows and doors, and clearly shows internal features like wardrobes and cupboards. The virtual model of the property is depicted from a bird’s eye view, roof removed, walls lowered and looking down on the internal features. They are developed utilizing advanced CAD and 3D rendering software, the same type of software used to create major animated motion pictures. Humans ensure the finished model correctly depicts the internal and external features of the home, important room dimensions and a north-facing compass. A single tonal finish is applied to standardise the finish of the 3D floor plans with all the features from the 2D floor plan mirrored in the 3D floor plan. 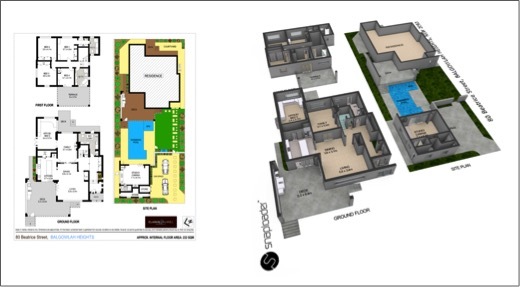 Snaploader is excited to have our 3D floor plans available on an innovative property marketing platform like iMAGECLOUD. Already offering the talents of industry-leading property photographers, designers, writers and video marketers you can now incorporate the next industry leading marketing tool for property campaigns. Snaploader 3D floor plans can be ordered by uploading a completed 2D floor plan to the iMAGECLOUD platform and within 48 hours a URL link to the completed 3D floor plan is delivered to your account. Your client can then copy the URL link into major portal listings or agency websites. Snaploader hosts the 3D floor plans that open in a web viewer browser with a control panel to zoom in or out, rotate and move around the screen. So when you are planning your next property marketing campaign, it goes without saying that a Snaploader 3D floor plan is an innovative marketing tool that will give any property listing an edge to secure the right buyer for the home. Ask your photographer about ordering a Snaploader 3D Floor Plan through iMAGECLOUD today!